Kathi Macias | Narration by George! We continue the celebration of my privilege to lend my voice to the work of some amazing authors. We’re looking at 41 books in 41 days. In this program, we look at four novels in the romance/life category. Three of these books are set in the same town. And we take a look at an unusual telling of the Christmas story. This entry was posted in Acting, Amber Schamel, Anne Baxter Campbell, Audio Books, Christmas, George Taylor, Historical, Kathi Macias, Narration by George, Reading, Regina Puckett, Romance, Samples and tagged adoption, Anne Baxter Campbell, Audio book, audiobook, audiobooks, Birth of Jesus, books, excerpts, fiction, historical, Narration by George, Novel, novels, romance, samples on August 11, 2015 by admin. 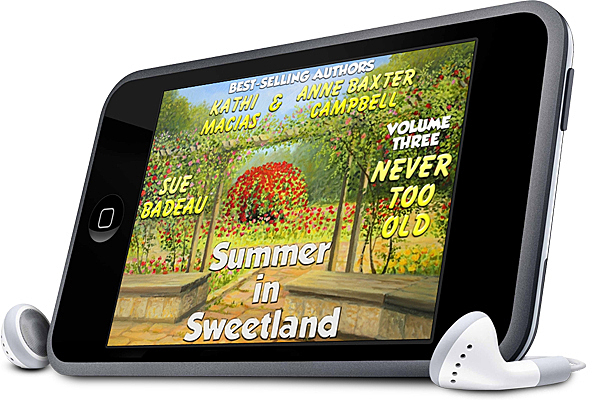 Helping Hands Press has released a series of books set in Sweetland. I have recorded two of those books. In this week’s podcast, I talk about these two books and play samples from the audio of each one. 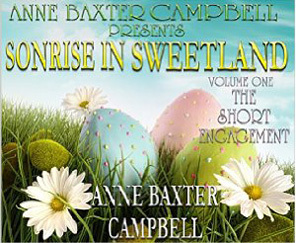 Take a listen to samples from Sonrise in Sweetland, The Short Engagement and Summer in Sweetland, Never Too Old. This entry was posted in Anne Baxter Campbell, Kathi Macias, Narration by George, Romance, Samples, Sue Badeau and tagged adoption, Anne Baxter Campbell, Audio book, books, easter, engagement, Kathi Macias, Narration by George, Novel, resurrection, romance, samples, Sue Badeau on April 7, 2015 by admin.